Islamabad: The Urs of renowned Pashto Sufi Poet Abdul Rahman Baba will be observed on Sunday. Rahman Baba was a member of the Khalil Muhmand (Bahader Kalay) sub-tribe of Pukhtunsé, a group that originally migrated from Kandahar to the Peshawar valleyé from the 13th to the 16th century. He grew up in a small pocket of Mohmand settlers on the outskirts of Peshawar. His poetry expresses a peaceful mystical side of local culture which is becoming increasingly threatened by less tolerant interpretations of Islam. A collection of Rahman’s poetryé called the Diwan (Anthology) of Rahman Babaé contains 343 poemsé most of which are written in his native Pukhtoé which is a dialect of the Pashto language found in Afghanistan and parts of Western Pakistan. 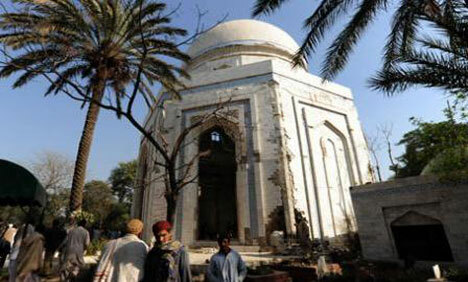 Abdur Rahman Baba died in 1715 AD. Radio Pakistan will broadcast programmes to pay homage to Rahman Baba on his Urs on Sunday.